Sacramento Youth Chorus is a place where young people come to do the extraordinary. 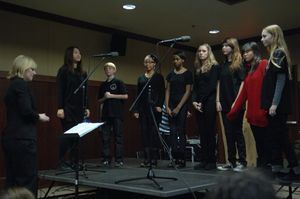 Children and teenagers aged 7-18 from across greater Sacramento gather together to become world-class singers through hard work, dedication, and passion. SYC is a performance-oriented music group that desires to instill the love of music and art in children. In addition to teaching the foundations of singing, reading music, and music theory, the chorus also offers an enriching social experience in friendships, cultural awareness, and community involvement. SYC offers an active rehearsal and musicianship schedule for choristers, the educational season will include master classes, guest artists, visiting adult and children’s choirs, regional, national tours and international tours, and engaging activities for the community at large. SYC welcomes children ages 7-18 and young men with changing voices, to audition for its nationally recognized performance-based ensembles for the 2014-2015 Season. All students ages 7-18 are encouraged to audition (girls, boys with changed/unchanged voices). No need to prepare an audition piece. No previous experience is needed. The auditionee will be asked to sing a simple song like “Happy Birthday,” and follow pitch-matching and easy rhythm exercises. Based on the audition, SYC Artistic Director determines which ensemble is the best fit for the student. Please contact MS. Clara Litman at clara.spac@live.com to register.